Get a chance to propel your startup into the US market! Taiwan Startup Stadium is inviting Taiwan-based startups to join the #TaiwanRocks Pavilion at TechCrunch Disrupt, as well as meet ups with Bay Area startups & a #TaiwanRocksSF Demo Day! Travel will take place September 3-9, and only 8 startups will be selected! @ TechCrunch Disrupt SF 2018! Join the #TaiwanRocks Pavilion at TechCrunch Disrupt, as well as meet ups with Bay Area startups & a #TaiwanRocksSF Demo Day! Travel will take place September 3-9, and only 5-8 startups will be selected! The winners are announced on the TSS Facebook page. Submit your application & pitch video to be considered. Please read through the rest of this page for more details and see if you're qualified. Are you a startup ready to go global? San Francisco’s biggest tech exhibition and hundreds of Silicon Valley investors are waiting for you! For just filling out our application and recording a 3 minute video pitch, you can win a FREE trip to San Francisco to showcase your product, raise funds, and develop business partnerships through matchmaking conducted by local insiders. Don’t miss out...this will be your ONLY chance in 2018 to go with TSS to the US market! This year, we’re going to TechCrunch DISRUPT SF (San Francisco), where startups attending in 2017 in total raised more than NT $1 billion in seed and A round investment. We are also having a #TaiwanRocksSF demo day filled with carefully selected angel and institutional investors suitable for your startup. So, what do you need to do? Just show us you’re business savvy, passionate for tech, and ready to change the world through your application and 3 minute video pitch. Application deadline is July 13th! The event organizer reserves the right 1) of final decision on the trip qualifications of a selected team, and 2) at the event organizer's discretion, to amend the final number of teams to be taken on the trip. Pitch at #TaiwanRocks Demo Day filled with angel and institutional investors carefully selected and targeted for your startup. Exhibit at TechCrunch DISRUPT San Francisco, where startups attending in 2017 in total raised more than NT $1 billion in seed and A round investment. You will have your OWN time to set up valuable face-to-face meetings with potential US partners and investors. Attendee must be available travel for Sept. 3-9, 2018. Important note: Due to TechCrunch rules, winning teams must pass final approval by TechCrunch Disrupt staff, and meet the requirements listed above. If you're unsure whether your team qualifies, feel free to contact us with questions. Primarily, teams will be selected based on how ready they are to exhibit to an international audience. Having a mature product, clear branding, and an engaging presentation will help. If our team is accepted, how many team members can join? Winning teams will be sponsored to bring one team member either Founder or Co-Founder. 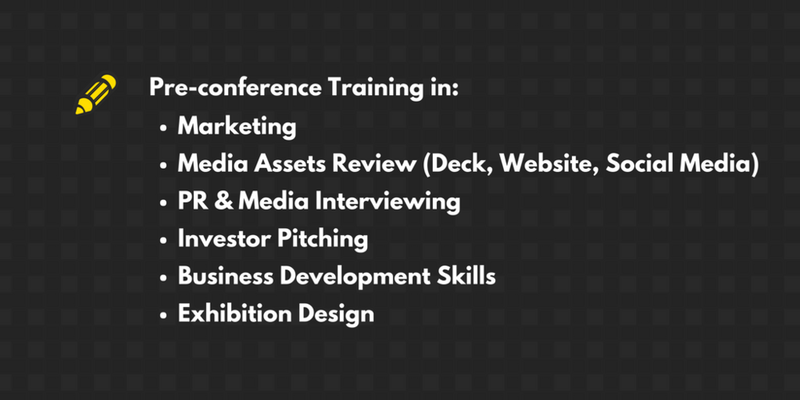 (Round-trip flight, hotel accommodations, conference passes, and exhibition space are included.) If additional team members would like to attend, they must arrange their own travel plans and cover their own costs of attendance.